It's old news by now that we all need to be cautious about sun exposure. You know that the sun damages your skin, leading to wrinkles, sun spots, and an older appearance. But the reason I want you to be careful about the sun isn't just to protect your vanity. It's to help keep you safe from something far worse than wrinkles: melanoma. When we talk only about the aesthetic effects of sun exposure, it's tempting to weigh the immediate attraction of a tan against the future consequences of damaged skin. But the dangers are far more significant than a disappointing look in the mirror. 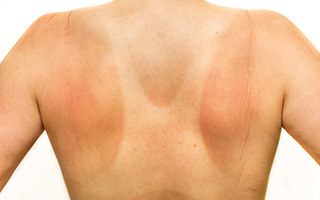 Melanoma is one of the deadliest forms of skin cancer. It can affect you at any age and it has a high metastatic potential. So not only should you limit your sun exposure to reduce your risk, you also should be on the lookout for other ways to fight off this deadly disease. That's why I was excited about the results of a new study. This study reviewed a number of previously conducted studies to see if there was a link between our nutrition and our risk of developing melanoma and/or our ability to fight it. They looked at articles studying links between melanoma and grape seed proanthocyanidins, selenium, vitamin D, vitamin E, epigallocatechin-3-gallate, resveratrol, rosmarinic acid, lycopene, and fig latex. They found that most of these can have a direct and significant impact on melanoma. The best were the grape seed proanthocyanidins, epigallocatechin-3-gallate (found in green tea), resveratrol, rosmarinic acid (found in rosemary, sage, and oregano), lycopene (found in tomatoes and watermelons), and fig latex. Selenium, vitamin D, and vitamin E don't have as clear a link to melanoma, but they certainly have other health benefits that make them worth incorporating into your diet. If the thought of unhealthy skin as you age isn't enough to convince you to limit your exposure to the sun, I hope that the reminder of the seriousness of melanoma is. These nutrients are a great way to supplement your defenses against this cancer. If you know you've already had more sun exposure than you should, pour yourself a cup of green tea and put the findings of this study to work for you. Green tea has several very strong studies behind it that suggest it can protect against melanoma. If you don't like the taste of green tea — or want more protection than one glass of tea can provide — I suggest taking Green Tea Extract. It provides many times more cancer-fighting nutrients than a single glass of tea can provide.